Yum! Just a few months ago we got a Dunkin Donuts nearby. I LOVE stopping there for a cup of coffee in the morning. 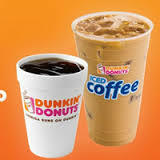 Right now, you can score a FREE Medium Drink at Dunkin Donuts when you join the DD Perks Club. Don't forget that lots of times these rewards programs send exciting coupons, special offers & more!